A long awaited tablet is just about to hit to make its grand entrance to Canada, the Flyer will be hitting shelve as of today. The tablet is running Android 2.3 with a Tablet oriented version of Sense. With Android 3.2 adding support for Qualcomm chipsets we expect the Flyer to be in line for an upgrade to Honeycomb 3.2. Unfortunately, unlike in the US where Best Buy is now including the scribe pen with the Flyer free of charge, Canadians will have to fork over the extra $80 to get in on the handwriting action. Official press release after the break. TORONTO, Aug. 16, 2011 /CNW/ - HTC today announced the upcoming release of the HTC Flyer™ tablet, a new Android powered 7-inch tablet that delivers the immersive HTC Sense™ experience allowing you to personalize your device to fit your lifestyle. The HTC Flyer features HTC Scribe Technology™ so it is compatible with an HTC Scribe™ digital pen , enabling you to draw pictures, get creative with photos, sign digital documents, highlight books, take notes that synch with recorded audio, and more. "Canadians demand a lot from their mobile devices and the HTC Flyer rises to the challenge with fully immersive visuals, on-demand entertainment and the ability to seamlessly capture, create and share anything from memos to videos and family photos," said Rick Babington, executive director HTC Canada. "The portability and web browsing ability of the HTC Flyer, make it the perfect device to stow in your backpack or briefcase. With note taking and networking options, it's the perfect companion for a student in class or an executive in the boardroom - and when the work is done, the play begins with gaming and social media options." The HTC Flyer features a 7-inch, LCD capacitive touch screen, 5-megapixel camera with auto focus and a 1.3 megapixel front-facing camera, allowing you to capture crisp, clear images when on the go or conduct a video conference with clients or classmates. The HTC Flyer also features the HTC Watch™ movie downloading service, allowing you to download movies over Wi-Fi® to watch any time on up to as many as five HTC Watch enabled devices on your account. Making the cinematic experience even richer, the HTC Flyer is equipped with dual speakers with SRS WOW™ HD surround sound. 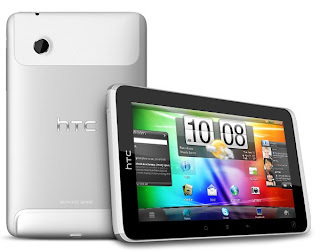 The HTC Flyer tablet will be available in Canada from The Source. Customers can find it in store beginning August 16, 2011, for $499.99. The HTC Scribe™ pen accessory is sold separately and is only available online for $79.99. For more information, please visit www.thesource.ca. About HTCHTC Corp. (HTC) is one of the fastest-growing companies in the mobile phone industry. By putting people at the center of everything it does, HTC creates innovative devices that better serve the lives and needs of individuals. The company is listed on the Taiwan Stock Exchange under ticker 2498. For more information about HTC, please visit www.htc.com. About The SourceBuilding on 40 years of excellence, The Source (www.thesource.ca) is one of Canada's largest retailers with approximately 700 locations nationwide. All stores offer a wide range of brand name consumer electronics including communications, computing and audio products. More than 70 per cent of Canadians live within five kilometres of stores operated or licensed by The Source.